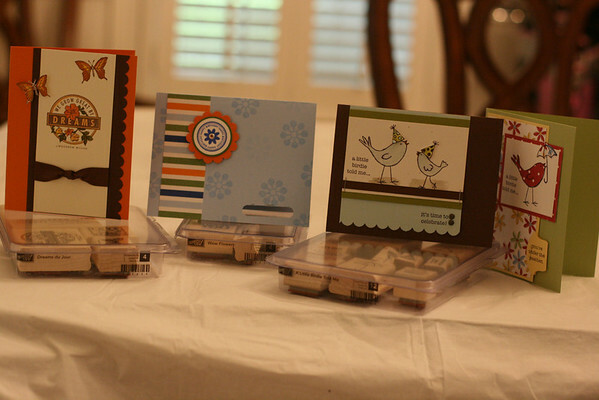 So I finally got my respective creative self together and hosted a little Stampin' Up shindig the other night. We ooh-d, ahh-d and drooled over the new catalog and made mental wish lists. Then we got our stamp groove on. There was plenty of stamping, cutting, gluing, chatting, coloring, punching (paper, NOT each other), laughing, stapling, inking and snacking. All the necessities for a fun evening. I think I'll like this demonstrator gig. Holly- are you a distributor? I did that years & years & years ago & it was great! Yes, I am now a demonstrator. Still quite the newbie though. I'll try and post card and scrapbook samples when I get them made--I promise not to drive y'all crazy with them though! I hope you'll think of me every time you call Demonstrator Services (if that's what it's still called). 6 years ago it could have been me on the other end of the line. What a great gig it was! Glad you're having a great time with it. Congrats, Holly, that is pretty cool. how fun! i bet you are awesome with this! :) i wish i was in texas! I had fun at your super duper party! You were the most awesome host. Sorry I had to leave a little early...geez...those kids! HA! i look forward to seeing the new catalog! good for you having a party! i always love your cards. I am glad you had a great party. I am a demonstrator too and love it. your cards are adorable by the way! THe party was wonderful! Thanks for being a great hostess.